Throughout someone’s career, no matter their profession, a standard merger is oft times perceived as having a negative impact regardless of any motivating factors. Much of the faculty and students at USU Eastern witnessed frequent connotations of such a merge come to life after the union with Utah State University. Particularly those affected by the reorganization of student services. While some involved within various departments fear a similar outcome of imminent changes, not everyone views the integration as adversely. I spent a morning with Lori Brassaw, the director of USU Eastern’s Library, and found that she has a unique positive outlook on the union of the two schools. Brassaw is under the opinion that our family members in Logan only want what’s best for everyone by helping us move forward. Dean Richard Clement has been working with Brassaw to help model our library after the Merrill/Cazier Library located on USU Logan’s campus. Dean Clement has been “more than gracious during the transition,” says Brassaw. Many of the exciting changes over the past year are to get more students into the library to utilize the growing resources they have to offer. Brassaw is aware of the growing demand for isolation needed to study, by themselves or together in groups. So she has built three new study rooms(which are now labeled) for either single or group use, groups taking precedence. You have the option of checking out each room in advance for a two hour max, or if you’re feeling brave by taking your chances on a walk in basis. All the rooms are equipped with tables and chairs, plenty of outlets for laptops, and whiteboards. And after working with student government, they plan on using smartboard technology in each room. Now that we’ve entered the digital age, USU and Brassaw agree that it is absolutely necessary to continually upgrade our resources. Dean Clement sent us dozens of new pc’s, some went into the computer lab while others were placed directly on the main floor. Projectors have been added to certain rooms as well as a new microfilm machine that can email directly. 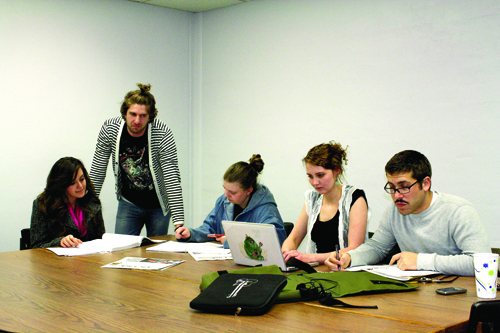 By Fall 2012 semester Brassaw hopes to add many other features to the library. She wants to hopefully put in new booth style or modular seating with blinds for privacy, similar to Merrill/Cazier Library. She wants to put in a new all in one photocopy/scanner machine for student use. She also wants to accommodate more students and their growing demand for Macs in the library. She’s utilized student fees by staying open nearly 600+ hours more than the previous year. Ultimately, Brassaw is aware of the students needs, wants and desires to help us succeed. Everything she does is motivated by getting more students into the library.